When the news came about the earthquake in Haiti I was in the middle of planning a lengthy mission trip to D.R. Congo. It had been over a year since I was last in Haiti. My thoughts and prayers were for my many friends and colleagues that I had come to know and love over the 10 years I served as a Country Coordinator there with Evangelism Explosion. But what could I possibly do, the tragedy was so great and our resources so small. I was soon convicted that even if I couldn’t do everything, I could do something. That something was WATER. We could help provide clean, safe drinking water. It was surely one of the most critical needs there. 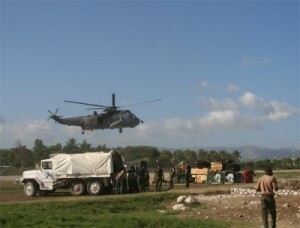 The airport in Port-au-Prince was badly damaged and closed, so I flew to Dominican Republic with my twin brother Dan. We carried with us 100 Sawyer Point One water filters, along with some medicine and a few supplies. Then we purchased more supplies in the Dominican Republic and boarded a small plane to Jacmel, Haiti to meet Pastor Banes, the Haiti National Director for Evangelism Explosion and begin our work. 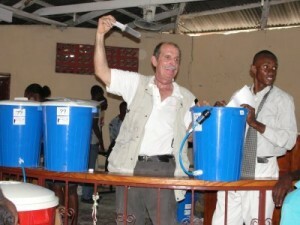 Over the next four weeks we distributed nearly five hundred water filters systems. All of this was made possible because of the generous support of our friends at Good Shepherd Community Church, Evangelism Explosion, Coral Ridge Presbyterian Church, United Caribbean Trust, GAIN USA and many, many others. 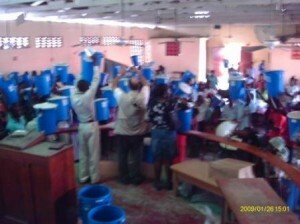 Since then distribution has continued and to-date nearly one thousand water filter systems have been distributed. Each water filter system recipient has committed to share the over 120 gallons of filtered water per day with at least ten of his neighbors families. This is effectively now providing clean, safe drinking water for 10,000 Haitian families; over 120,000 gallons of clean, safe water EVERY DAY for years to come. What is even more exciting is that most of these filters were distributed to people trained in personal evangelism and all of this done through the local churches. This means people come to get clean, safe drinking water and hear about the LIVING WATER available by trusting in Jesus Christ. As funds become available we pray more water filter systems can be distributed. Many thousands more will be needed. When the water filter systems are distributed in this way it takes only $5.00 per family to provide all of the clean safe drinking water they need for years to come, less than a penny per day per family . Nobody can do everything but everyone can do something. Thank you for caring and supporting this effort.